Our services include the identification of the noxious plants on your property, removal of the plants and an ongoing treatment plan if elected. Every property is different so our prices do vary. Please contact us for a consultation and estimate so we may start the process of solving your poison ivy problems. We offer light brush clearing as well. Buckthorn is a problem across Michigan, particularly in the urban areas. Buckthorn crowds out all other plant life and makes areas impassable. 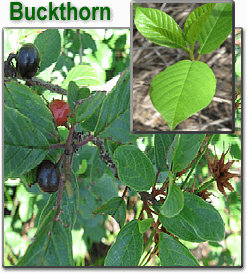 Identification: Glossy buckthorn has dark green & oval leaves with shiny smooth edges. Common buckthorn leaves are very similar, but have toothed edges. Poison ivy can be very dangerous and hundreds of people are hospitalized every year from trying to remove it from their property. We are highly trained in our field and have the experience to handle the removal of all noxious plants in Michigan. Keep your family safe from poison ivy by scheduling a consultation today.